When I find a recipe that's easy, relatively inexpensive, and yields delicious results, I tend to stick with it. Sure, I may tweak it here and there each time I make it, but the basic method and ingredients usually remain the same. I've been very loyal to this seared and roasted pork loin, varying only the type of preserves depending on what I have on hand. (For the record, our favorite so far has been cherry.) I'll occasionally add some garlic powder (in place of actual garlic) and ground mustard to my rub and have experimented with tossing in some granulated sugar in the hopes of forming a nicer crust (it worked! ), but generally speaking, searing the loin then popping it into the hot oven for a few minutes has never disappointed me or my beau. Because I'm working full time now and on the hunt for recipes that are either quick or can be put in the slow cooker in the morning, this Paula Deen recipe caught my eye. Would I be able to depart from my tried-and-true preparation of oinker? More importantly, if I did gird my (tender)loins and try something new, would it be worth it? The answer to both questions is yes. The first thing I must mention is the aroma that emerges from the crockpot. Nothing, and I mean nothing*, beats opening the door after a long day at work and getting hit with the smell of simmering savories. What's even better is that there's no more work to be done! Just slice the pork and dish it up. Boom. Dinner. *Well, if I'm being fair, being met at the door with a great big hug from a loved one might also compete for best greeting ever. This was really good. The veggies all got nicely tender and the pork was pull-apart perfection. Serve a piece of bread or roll on the side because that broth is too good to get left behind. It seems I have a new dilemma--will my trusty seared loin taste as good now that I've ventured into slow-cooker land? We shall see. Line the bottom of a slow cooker with carrots, diced sweet potatoes, and onions. Season pork tenderloin liberally with salt and pepper and place over the veggies. In a medium mixing bowl, whisk together the broth, preserves, mustard, and thyme; salt and pepper to taste. Pour glaze mixture over tenderloin. Cover and cook on low for 4-6 hours, or until the veggies are tender and the pork is at least 135 degrees F.
A comforting and tasty dish. I love pork loin!!! This is a wonderful recipe, Grace! Perfect for a cold winter day! I love coming home to a house that smells of a tasty dinner! The pork looks and sounds wonderful. It looks very tender and juicy! A hearty and delicious meal. This sounds REALLY good! I wish it would have greeted me when I walked in the door tonight! What a ridiculously delicious photo, I love how juicy it is! I have just ordered a slow cooker from amazon and can't wait to use it! This is bookmarked! 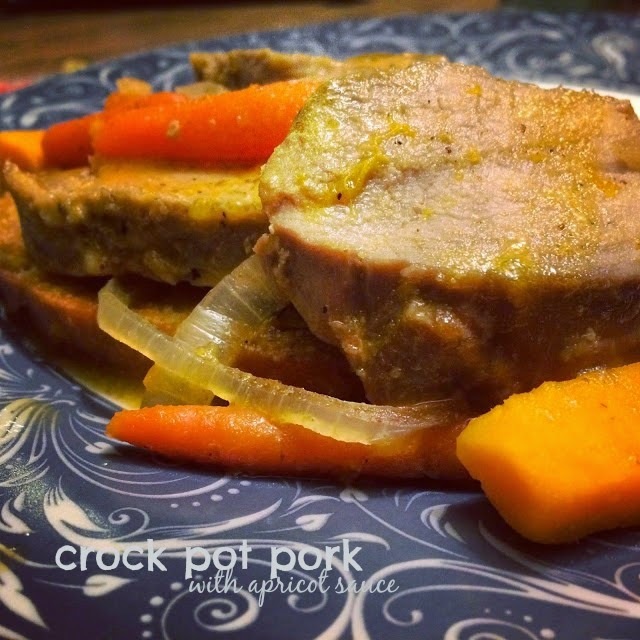 Perfect winter comfort crockpot meal! I tend to stick to my favorite recipes too and make them over and over. But for this (and Paula Deen, she does have some gems) I'm willing to experiment! Pork loin works here and yours sounds delicious! I need to get the crock pot out, I haven't made a PD dish I didn't like even though I play with the recipes. I wonder if they sell 3 gallon size crock pots for the dozen person family? Because this sounds delectable. I need to forward this recipe to my daughter in law for my picky son. I love the sound of this. (And wish slow cookers had been around when I was raising my kids!) Knowing your dinner was cooking while you were gone makes life so much easier...and I bet your home smelled divine! I have the worst luck picking good crockpot recipes. Thanks for test-driving this. Going to try it during this crazy week. I want to come home and be greeted by dinner ready and waiting! The apricot preserves sound great in this--and so do cherry. This brings new meaning to One Pot Meals, Grace. I'm sure the aroma was as intoxicating as a hug from a loved one!!! Thank you so much for sharing Grace...Congrats on the new full time job!! !